The death of Soumya Vishwanathan a few months ago has opened up a pandora’s box of opinions. Soumya was a journailst with Headlines Today. She was returning home at 3 a.m. The police found her car rammed into a tree and a bullet lodged between her ear lobe. She was declared as brought dead when she was taken to Delhi’s AIIMS. The reason for her death is unknown although a murder case has been registered. The reason could be anything from road rage to personal enemity. This case has opened up the ever sensitive dealings on women’s late working hours especially in the BPO sector. As India had hit its biggest liberalization with the IT boom a few years back, lifestyles and people have changes a lot over the years. Almost everyone studying Engineering wants a job in THAT company and thanks to campus selections this is becoming more of a reality than a dream. Many are just blinded by all the luxury that a job this good offers. 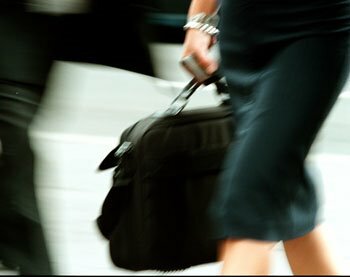 With regards to security at night, apparentley companies give the utmost security for women while travelling. They have the company vehicles, drivers and sometimes even security guards to make sure they reach home safely. But how much of this is acceptable and allowed in Islam? Unlike what many people think, women working is acceptable in Islam. It is not compulsory but it is not frowned upon either. The women of early Islam were career women themselves. Khadija (may Allah be pleased with her) was the Prophet’s first wife. She was one of the best in her business. Islam encourages both men and women alike to do business rather than to work for someone else. Many women in Islam were scholars. In fact, many Muslim men studied the teachings under them. The wives of the Prophet, Saffiyah and Umm Salamah were among them. Islamic scholars were leading in science from the early times. Science forms an integral part of Islam. Everything from the Big bang theory to medicine is written clearly in the Quran. During the days of the Prophet, women like Ruffidah Aslamiyya, Umm Zaid and Umm Sulaim accompanied men to the battle field to treat the wounded. They acted as surgeons and doctors giving medical care. Through the history of Islam women have played an important part in society from politics to medicine. It would be foolish to say that women in our ummah are backward or uneducated. Islam stresses on the education of women. Noone can stop a woman if she wants to pursue her education. No other religion gives this kind of freedom. But now, women want to work their night shifts and in close proximity to men and many are hijab-less. they want to go out an have their fun. This is unrestricted freedom. This is not allowed in Islam. The need to go out and work, especially at night in not a necessity. Women require the security and guards to make sure they are safe. What is the need to work so desperately? Women could easily work from their homes or have jobs that are not so demanding. She does not have to give first preference to her job and neglect her family. How many ever laws and strict enforcements come into action, harassment will still be the same. Especially in India. Yet many fail to understand this. They can only think of either extremes- working like as if your lives depend on it or sitting at home behind bolted doors doing chores. There is something in between all this. There is an alternative. It is upto women to find this missing link and make it work. ← The Easy Way Out??? there are cases where a woman has to support her family…what do u think she shud do ? when i sad she has to suppor her family…i meant there is no guy to support!!! so…u suggest hijab fer ppl of other religion too eh ? think im crazy to suggest that? u do or u dont ? i think sowmya has nothing to do with hijab…but working late..yes there u have a point….but any hijab is not going to avert a planned murder! well, this is just my opinion and how i view this episode..